The Ducks Drop at 4:00!!! What happens when you dump 12,000 rubber ducks into the raging waters of the Deschutes River? 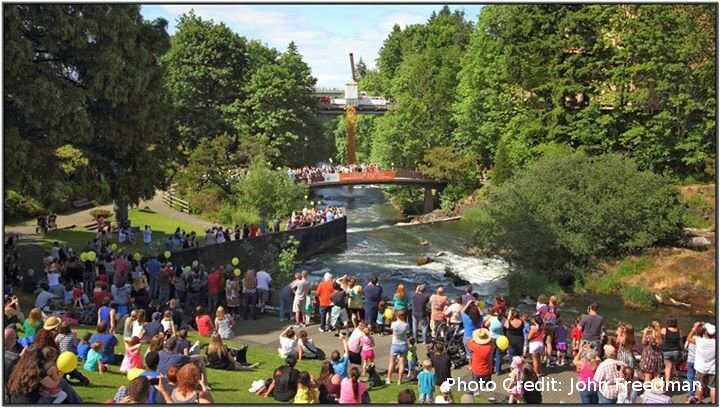 Every year, Lacey Rotary stages the wildest event of the fundraising season- 12,000 rubber ducks racing to the finish line trying to win prizes for their lucky ticket holders. But the real winners are the area youth and charities. Every dollar the Lacey Rotary receives from Duck sales goes to local charities, community service projects, and scholarships. The race begins at 4:00PM on the 1st Saturday in June. But the FUN starts at 11AM. That is when you can come on down and sample delectable delights at the Family Food and Fun Fair, with a variety of victuals served up by local eateries. And once you've satisfied your hunger, you can sit back and enjoy lots of live music and entertainment provided by area high schools and middle schools. Don't forget to let your young ones have a romp in the Kids World, where there are all sorts of FREE activities, games, and chances to win lots of prizes!!! To enter the dash for your chance to win one of this year's amazing prizes you can buy your duck (or a whole flock) from any Lacey Rotarian, or at any participating ticket outlet, or the day of the event at the park. $5 per duck or $100 for a whole flock! Where Does the Money Go? What Can you Win? Grand Prize: Chance to win a 2016 Ford Mustang Convertible!!! 1st Prize: Disneyland Vacation for Four!!! 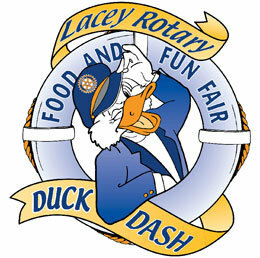 100% of all proceeds from Lacey Rotary Club's Duck Dash are distributed to Charitable or Community Service Projects. Thank you to all our terrific sponsors who help make this event possible!